Many of our clients desire a unique and beautiful classic roof that brings out the beauty of the desert landscape and the unique environment of many of our Las Vegas neighborhoods. One approach we recommend for clients looking for a classic touch or who are refurbishing an older home that has historical elements is to consider a roof made with reclaimed antique tiles. Reclaimed tiles may come from as far away as Europe or South America. Often, they have graced historic homes for many years and have a beautiful weathered look to them. They bring the colors, tones and materials of their region and reflect the artisanship and history of their countries of origin. Terra Cotta Reclaimed Roofing – Terra Cotta has been used in classic antiquity for storage and decoration. Numerous European villas and farmhouses incorporate the warm-hued material. 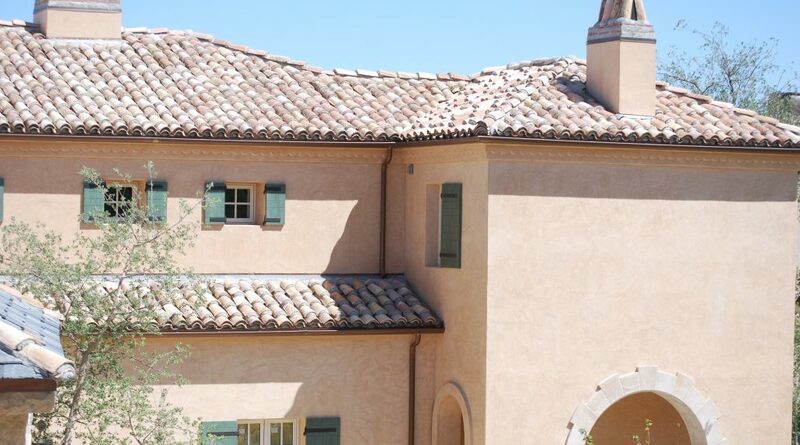 Reclaimed Terra Cotta roof-tiles are restored according to the highest standards and reflect traditional practices. They are available in various colors, sizes and patinas. 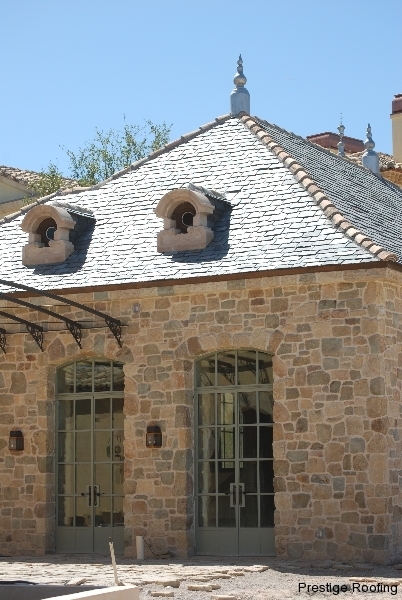 French Flat Reclaimed Roofing – This style originated from the region of Normandy and tiles are typically ½ – 1 inch thick and longer than clay tiles, providing a smooth, flat look. This style is used in France, England and the United States. Mediterranean Mix Color Roofing – This style comes from Southern Italy and uses peach, ochre yellows and orange hues. It complements the colors found in the open desert and melds nicely with the surrounding natural landscape. It is a popular choice with designers and architects. Clay tile roofing has been used throughout history to protect homes, particularly in areas of heat and sun. There’s a good reason they’ve been around a long time. 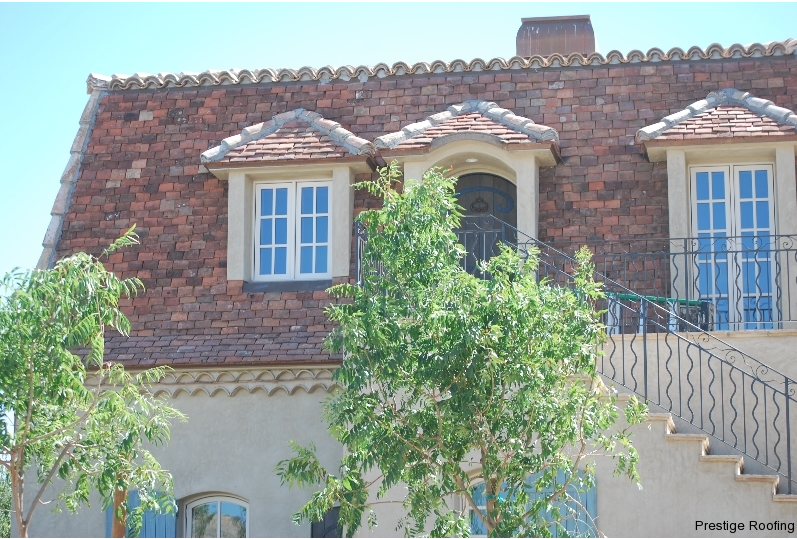 Clay tiles are highly durable and can last hundreds of years. Carefully selected beautiful antique tiles can be repurposed for almost any home and are a perfect choice in our hot, dry desert climate, helping to insulate the home from the sun’s rays and keep the home’s interior cool. Tile roofing is appropriate for homes with a low slope roof (20-50 degrees) and homes built to carry the weight of a tile roof. Fortunately, for most homeowners in Southern Nevada, this is not an issue since most of our homes are designed with tile roofing in mind. 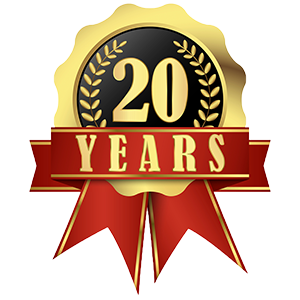 As a custom roofer, Prestige Roofing offers antique tile roofing services to our clients in Southern Nevada. We have completed several projects using tiles imported from Italy and France, two of which are shown on this page. We work with several sources of quality antique and restored tiles to help you find just the right tiles for your custom tile roof project. If a touch of classic tile is something that you would like to explore for your new or replacement roof project, contact Prestige Roofing for a free consultation on your project.